Both Kent and I are suffering from colds we picked up a few days ago. We spent a large portion of the day in our cabin resting in with hope that it will subside by the time we head home. The executive chef Ed Sayomac and his team created a grand feast for lunch on this day. 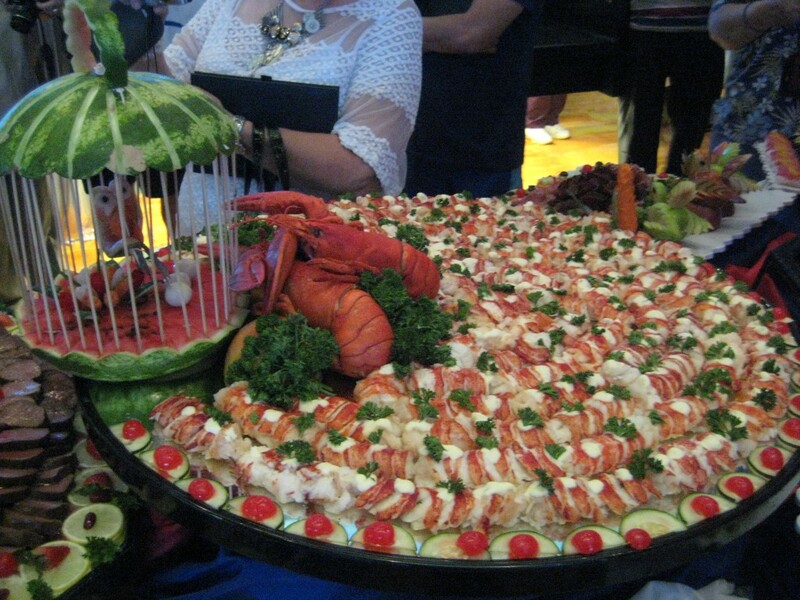 A large area of the dining room was converted into a vast buffet to rival that of any hotel in the world. 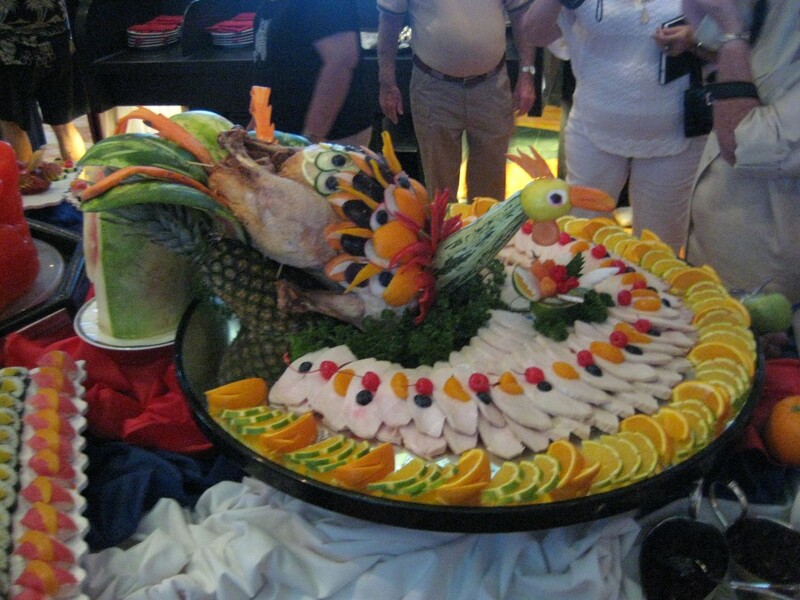 Every item of food was beautifully presented, including sushi, roast turkey, lamb chops, shrimp, seafood, lobster, roast beef, an extraordinary array of desserts and more. 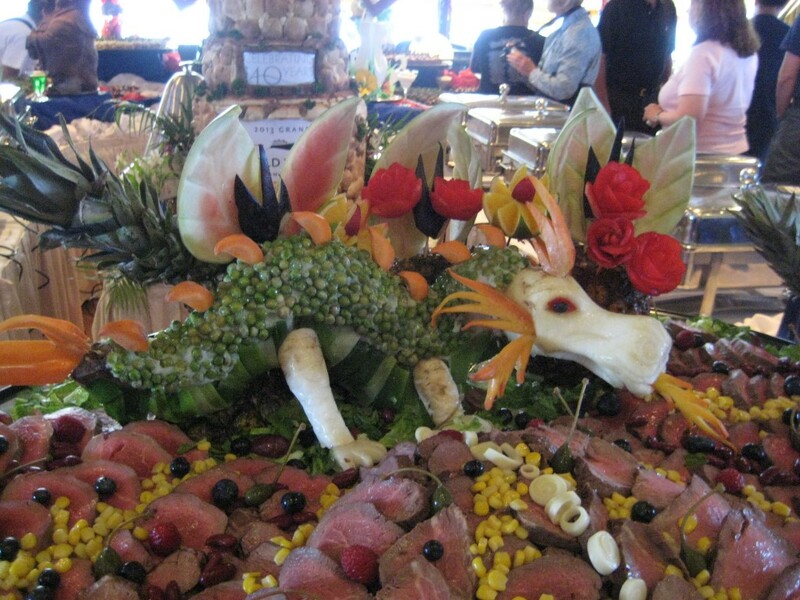 Guests were invited to view and photograph the amazing buffet for one hour prior to the serving of the buffet. 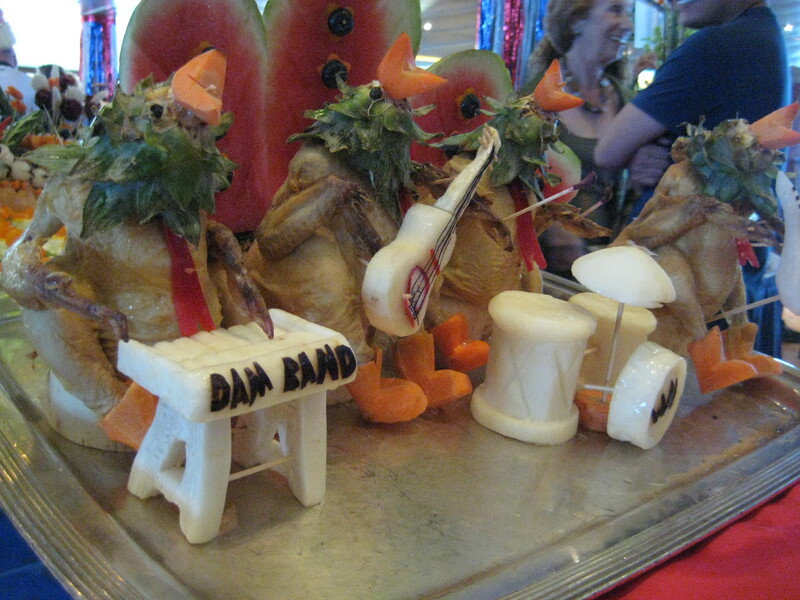 Once the buffet was opened, the guests filled their plates high and wide as if they had never eaten before. Before long the entire buffet was no more. Mark pushed aside a couple of the older people as they cut into the line. He hates that! The afternoon included another guest talent show, which we once again found out is very little. Most of the participants of the show were guests who had performed in the last talent show, but there were a couple of new talents as we say. There was a woman who had been on America’s Got Talent and does a variety of bird whistles. Not what I call your usual or ordinary talent. Also performing at this show was a gentleman dressed up in a red dress, blonde wig and black boots performing a Nancy Sinatra number, “These Boots Are Made for Walkin.’” Not Pretty, but the best of all! This night was our final formal night and grand farewell dinner. Tonight we invited Phillip Huber, the marionette artist, to have dinner at our table. We enjoyed talking more personally with him about his life, work and passion. The Unexpected Surfer Boys performed the best of the Beach Boys music in the Queens Lounge. They are a group of four young Americans from New York City who also do a Frankie Valle musical program. They harmonized very well together and are also as cute as a button. As we awaited the concert, Heidi and Constatine, German and Greek couple, who usually sit near us at the shows, said “Hello” and Heidi asked if she could take Kent’s picture, as he has always reminded her of Yves St. Laurent (of course he does). She asked Kent to pose with Jeri (see March 29) who was eventually selected to join the boys on stage for a couple of songs. After her fear of falling subsided, she seemed to enjoy the attention. I guess Heidi knows YSL who designs for her while they are in their Paris home. They have one in Palm Beach, NYC, and Athens, too!